The latest model of Porter ETUV’s Orchard Boss tractor features a 125 hp Perkins 1100 Series engine package designed in conjunction with Porter to achieve the specific performance needed by growers. This gives the new tractor very quiet and reliable performance with great fuel economy. 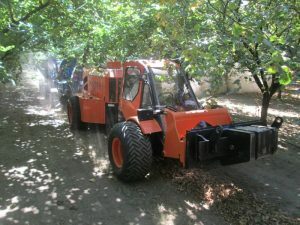 This model, the second-generation Orchard Boss, offers a purpose-built, low profile design for a wide variety of uses such as spraying, sweeping, and mowing in the tight operating environments found in most orchards. With a height of 67 inches, this highly specialized tractor has the power to easily pull and operate numerous attachments for use in orchard harvesting and maintenance, but with minimum impact to low branches. It also provides carbon filtration in the cab for operator comfort and safety. Over the past five years, Perkins Pacific worked closely with Porter on application engineering and the design of the power system. Perkins Pacific’s application engineers and sales team worked directly with Porter to meet emissions requirements, operating targets, and temperature goals. 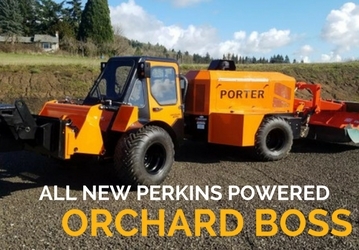 Perkins Pacific then worked with Porter for onsite testing and adoption of the engine, evaluating its performance prior to production to ensure the Orchard Boss exceeds operating needs.